The deal was, use and review for three months and either return the bike for free or, keep the bike for a discounted price. Our review will be in three parts, one after each month. So here is month one! As soon as the Toddlebike arrived, we ripped open the box to find a brightly coloured small trike. Dave was extremely relieved to see that it did not require building! (I think he is still getting over the stress of trying to build the Little Tikes Coupe last December) It comes ready to ride. So we removed the packaging (minimal- which again is good) and gave the bike to Gabriel. 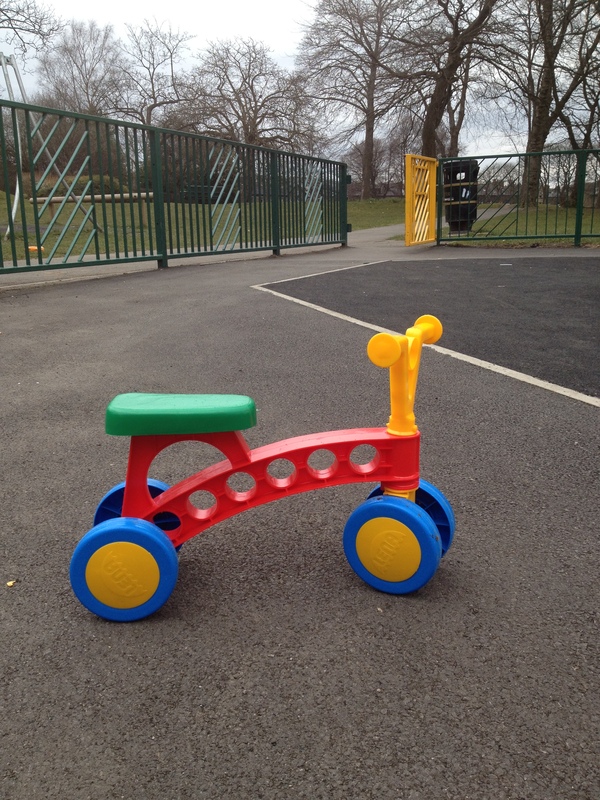 Innovative ‘Pre-Balance’ bike for ages 1-3 that is super-lightweight (0.8kg) and develops cycling skills indoors and out. 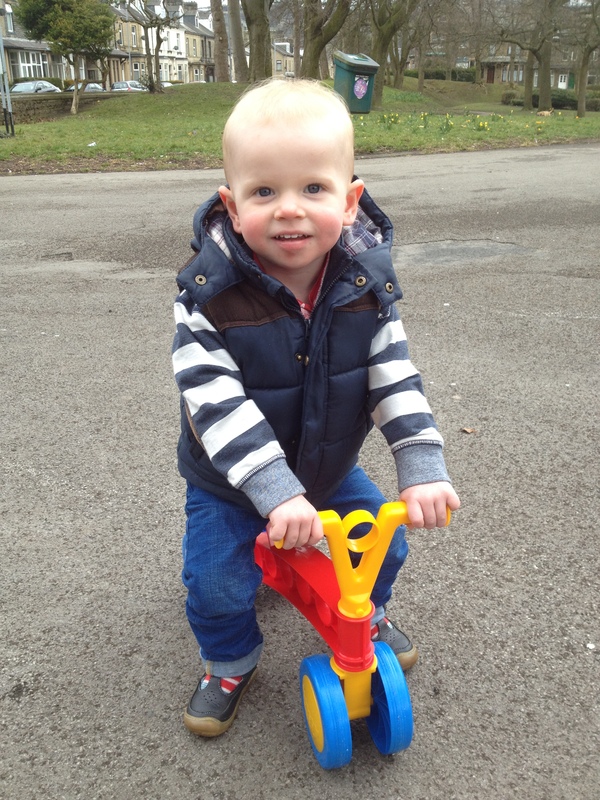 All-terrain and pedal-free, Toddlebike is a practical, healthy way to get out and about for independent, active Toddlers. A fun and smart alternative to traditional ride-ons and better suited to toddlers than big, heavy trikes or balance bikes. 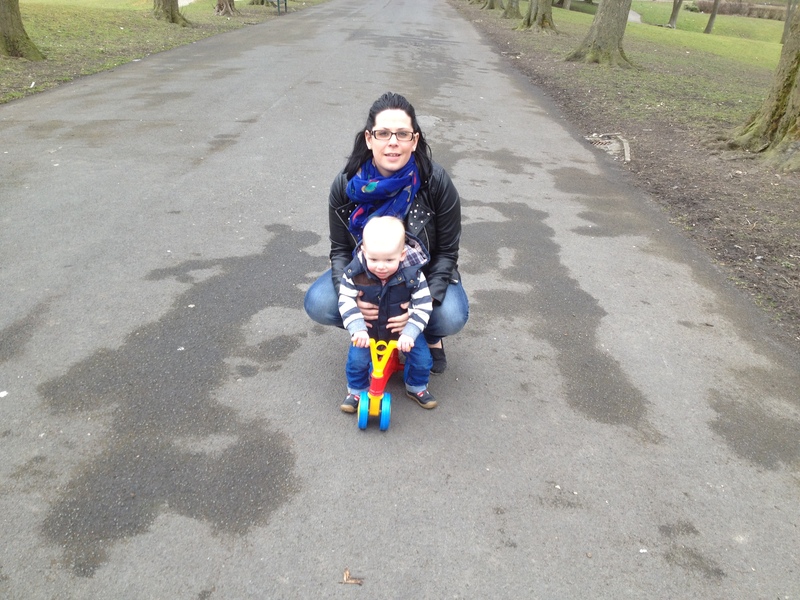 Gabriel was exactly twenty-two months when we gave him the Toddlebike. 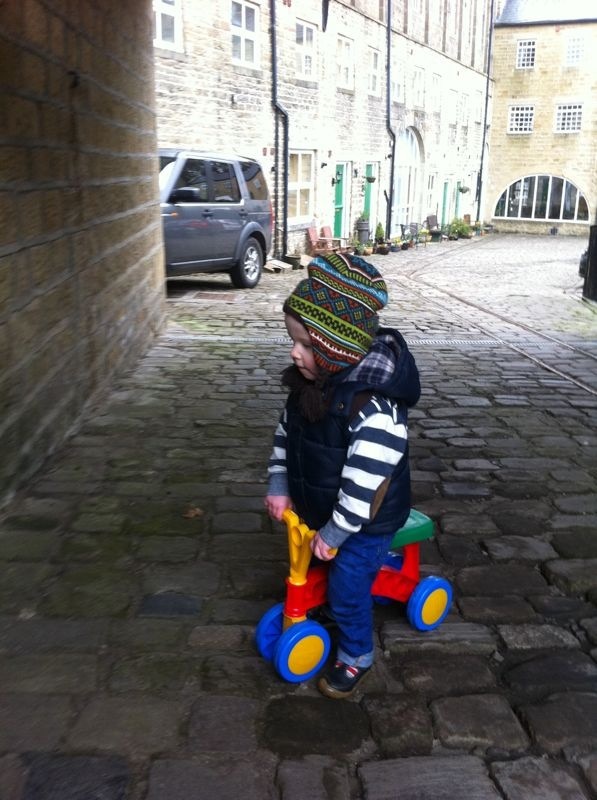 It isn’t his first bike, we bought him a three-way trike from Mothercare for his First Birthday last June, but to be honest we haven’t used it much because the weather hasn’t been great and also, it’s pretty bulky to take anywhere in the car. At first I thought the Toddlebike was very small, something that Gabriel might outgrow quickly, but I feel I may have been wrong. He loves it. He absolutely loves it! I would say that it took about two weeks for Gabriel to master the art of riding the Toddlebike correctly. It may look simple, but the toddler must sit on the seat and upright enough to be able to reach the handlebars. 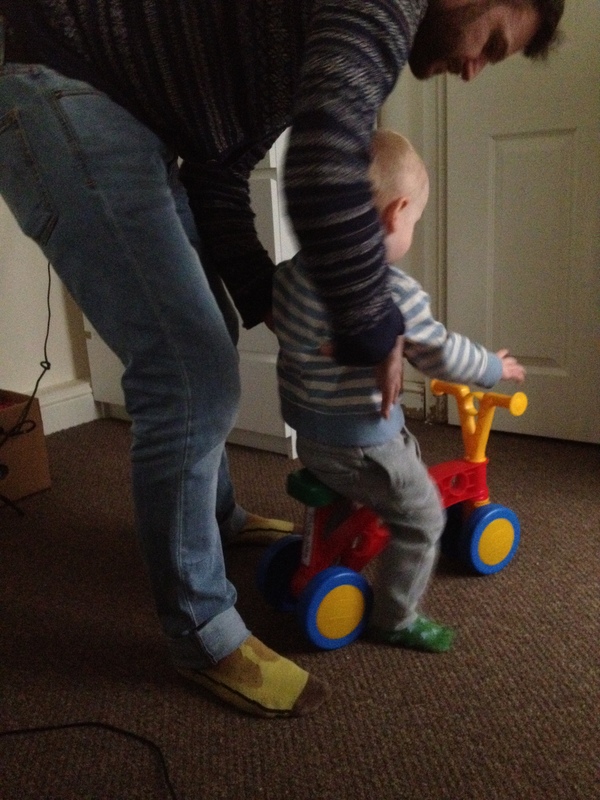 We started the Toddlebike trial indoors, in case of injury! 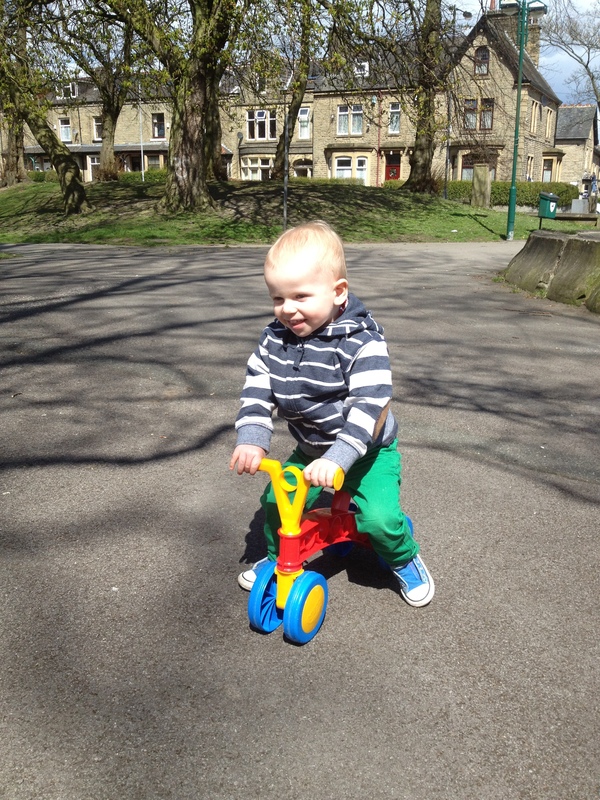 The first day Gabriel sat on the cross-bar, and a lot like Fred Flintstone used to, ran with the bike! He had a great time, although it was clear he was a little frustrated. He knew that something wasn’t quite right, probably because he was pretty uncomfortable! But he could not figure it out! We tried to sit Gabriel on the seat and show him how the bike worked, but he just sat back onto the crossbar. After a few weeks of pushing the Toddlebike around the playroom, riding the cross-bar and running with the bike, Gabriel seemed to suddenly understand! 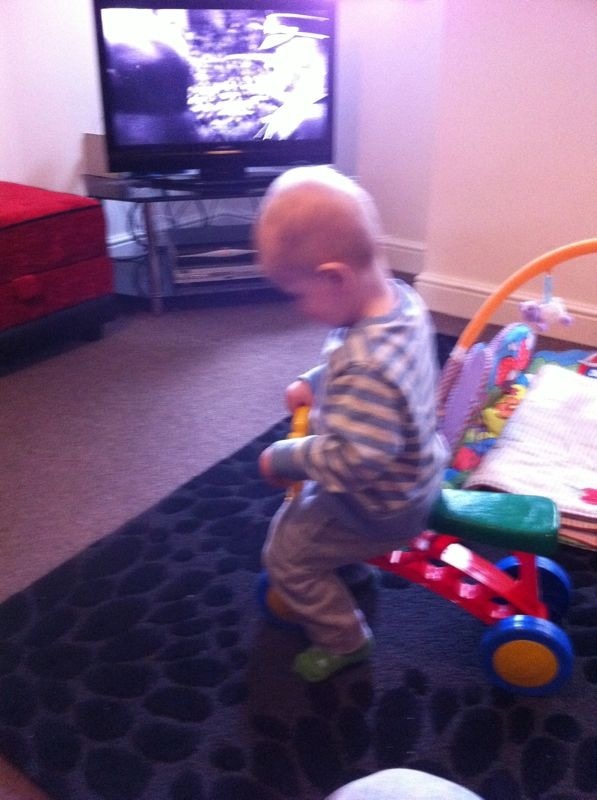 He sat proudly on the seat, and rode the bike around the sofa giggling away! He face was so excitable. It was a great moment. It just so happened that, that day was a lovely Saturday morning. We agreed that Gabriel would be ready for outdoor ride, so we headed to the park. 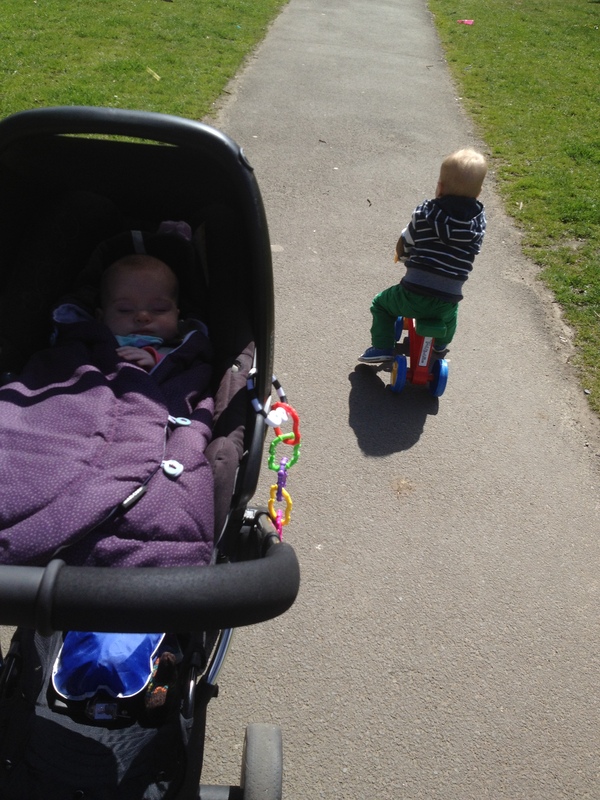 We put Willow in the pram and let Gabriel carry the Toddlebike into the park himself. Once inside the park he hopped on the bike and he was off! 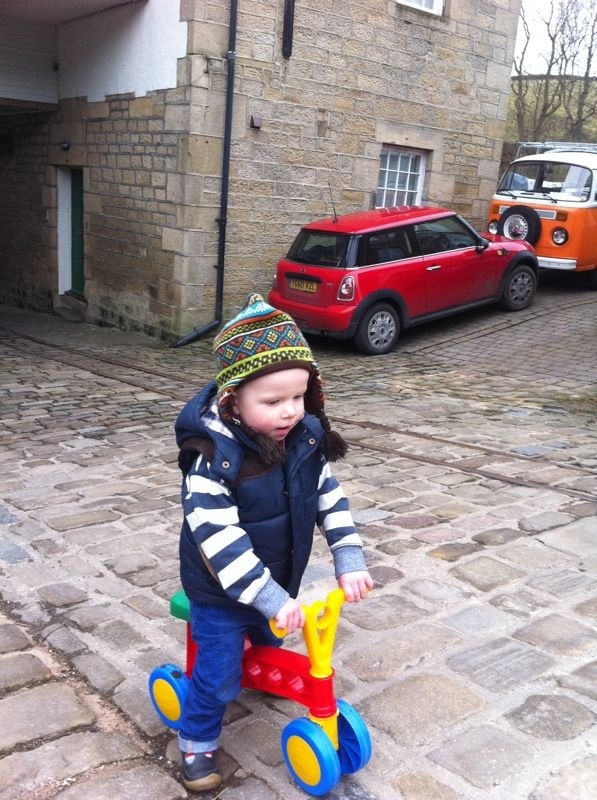 He loved riding the Toddlebike outdoors. He soon learnt to pick up speed by ‘pedalling’ with both legs simultaneously. He giggled and squealed as he rode. We had a lovely few hours. 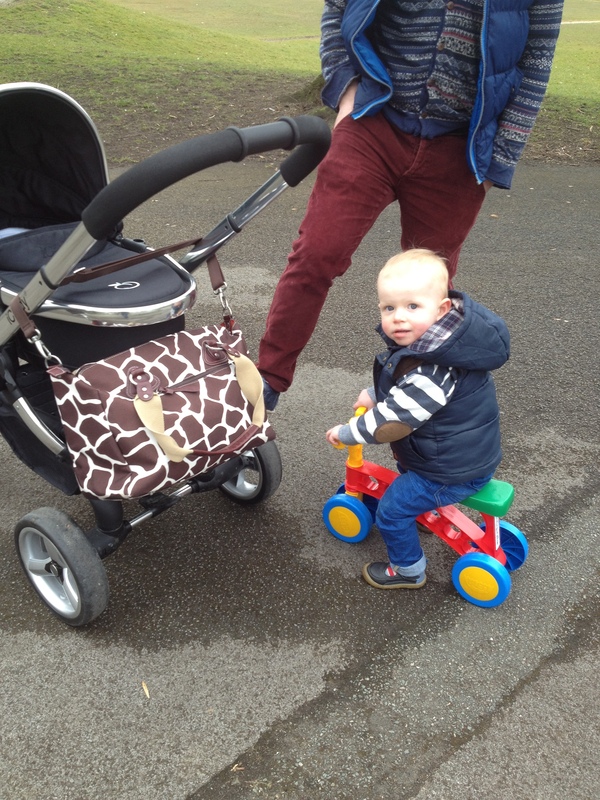 From a Mummy’s point of view, it was great to not have to bother with the double pram incase Gabriel became tired, or be having to lift Gabriel in and out of his trike, because the Toddlebike is so small Gabriel can hop on and off as he pleases. 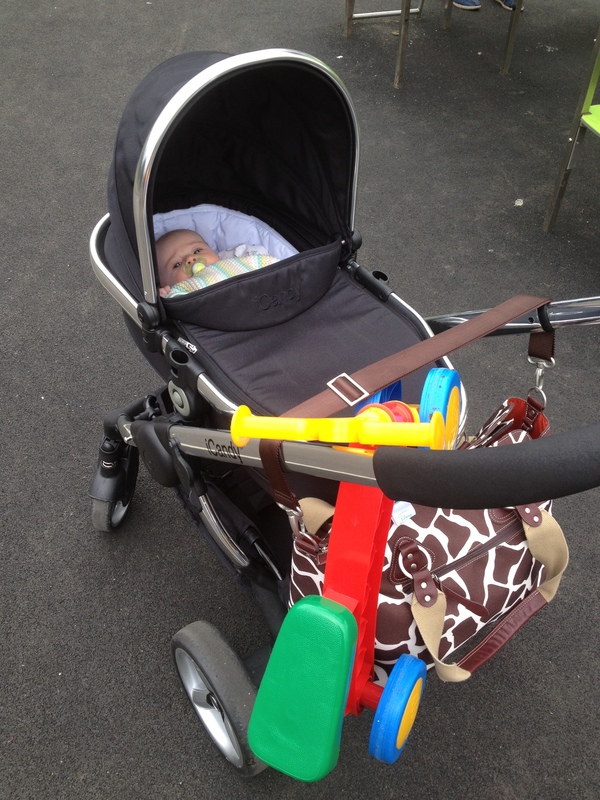 A really useful aspect of the Toddlebike is that it can be hung from a pram easily, leaving your hands free for pushing. 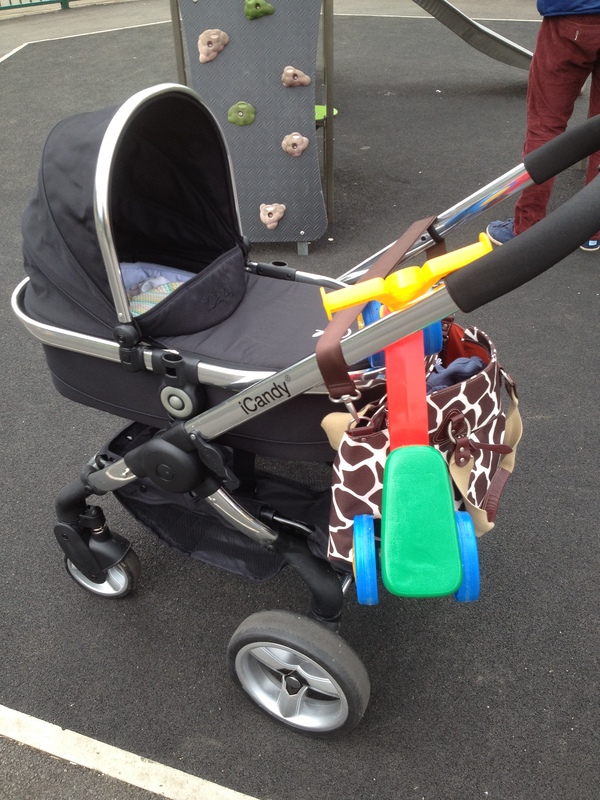 The Toddlebike did not scratch the chassis of my pram either. 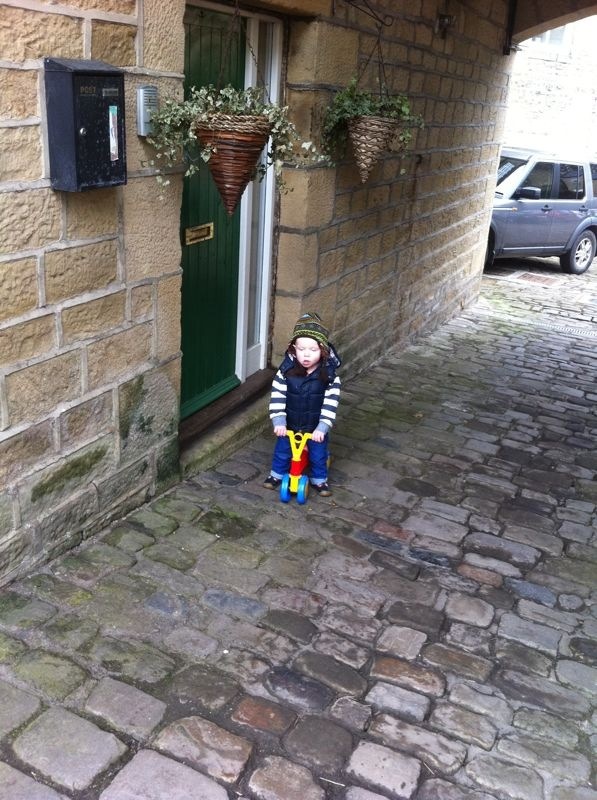 Terrain wise, Gabriel of course preferred the tarmac. Why? The speed! He soon learnt that the smooth surfaces meant easier, fast riding! Although on occasion, Gabriel still does walk or run with the Toddlebike! See him on the video below! We’ve encouraged Gabriel to ride on the grass, on the dried mud patches and also on the uneven pavement, and he managed all these terrains with no problem at all. 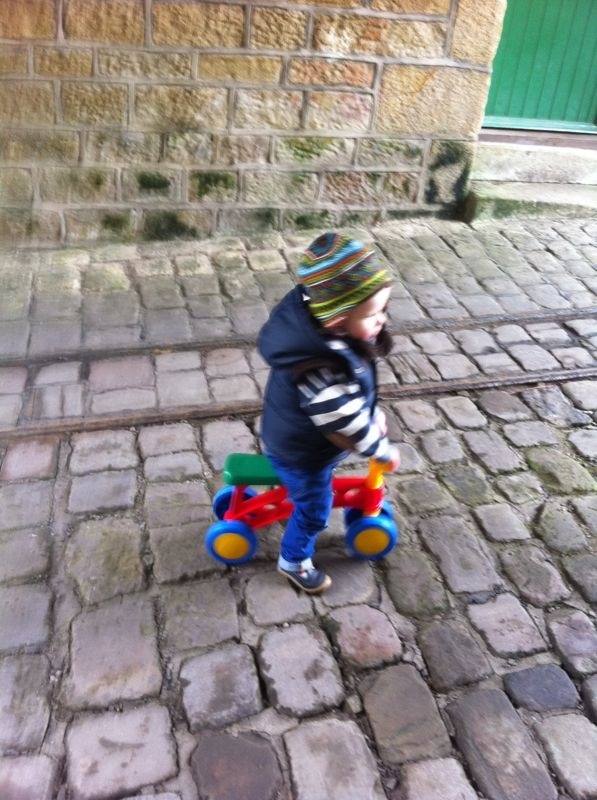 He rides next to the pram on the paths too. 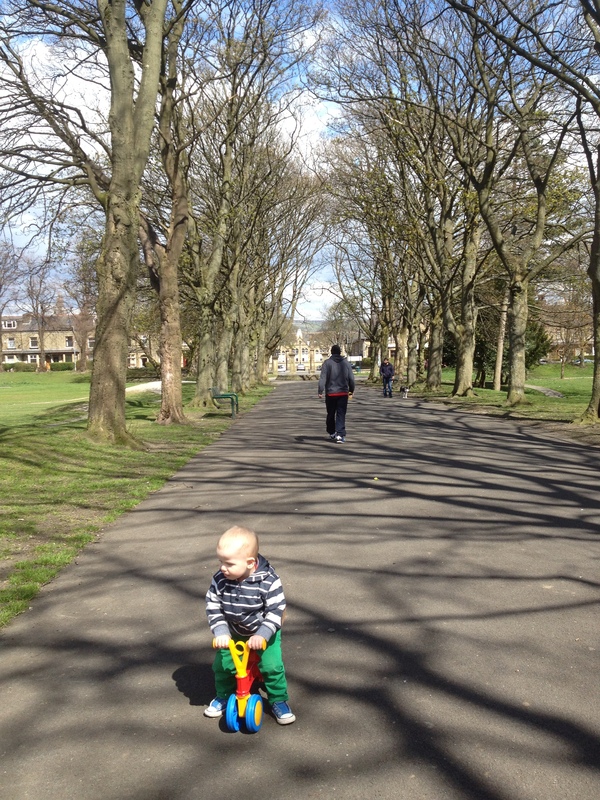 We’ve taken the Toddlebike to the park four times now. It would not be an exaggeration to say that Gabriel is obsessed with it. 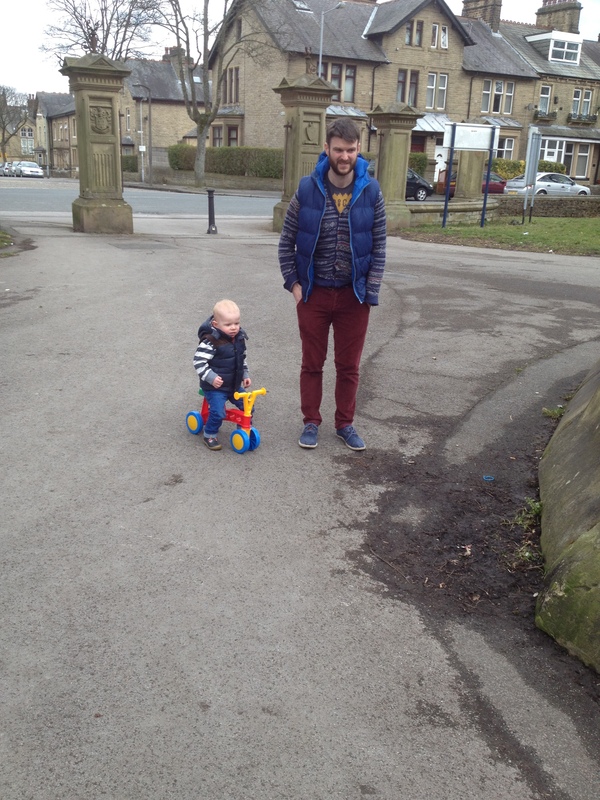 As well as going to the park, we also play outside our home on the Toddlebike. We live in a small hamlet, with rather steep inclines to get out of the village and so we are slighty stumped when it comes to ‘playing out’. We do have a garden, although it is grassed and Gabriel prefers playing at the front of the house. Our house is part of a new-ish estate built with part of a very old Mill. This means there are a lot of cobbled paths and tracks to contend with. Gabriel however, was not phased by this ‘terrain’ and set about going up and down, and round and round! 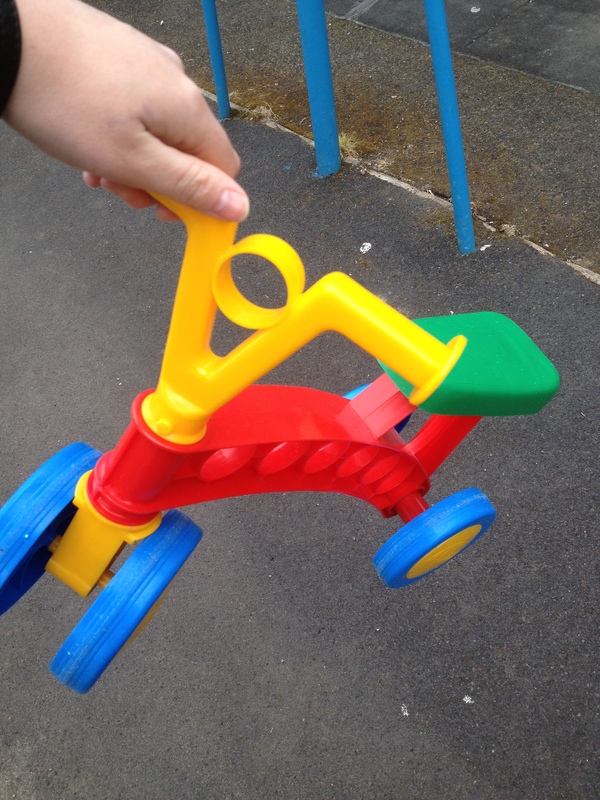 At the end of month one, I would have to say that the only negative part of trialing the Toddlebike is the tantrums that parents may have to deal with when coming inside the house after playing and putting the Toddlebike in the car boot etc! Gabriel is at an age where he is very emotional and does not see reason very easily! 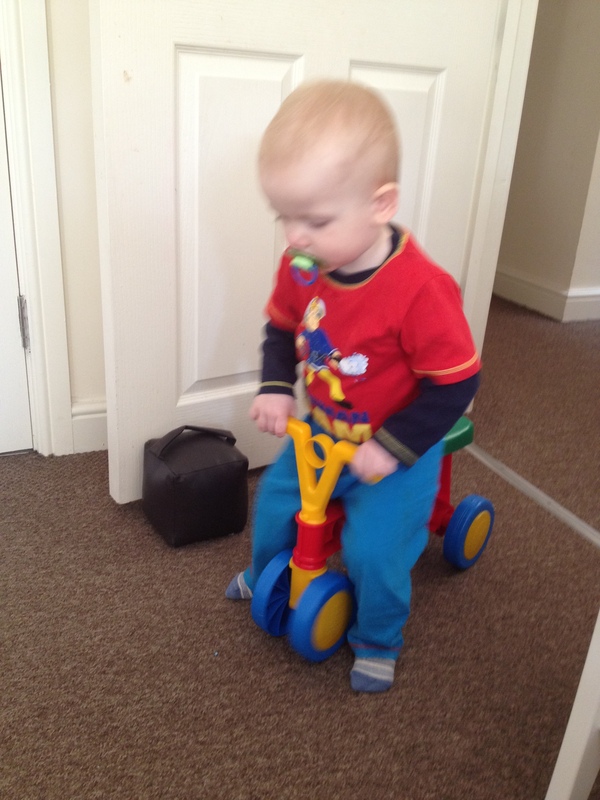 But obviously, that only means that he loves the Toddlebike and does not want to stop playing on it! I have to admit, we have had to start hiding the bike (with the Little Tikes car, incidently) if we aren’t going to be playing outside! Out of sight out of mind?!! Finally here is a video of Gabriel having finally mastered riding the Toddlebike on our last trip to the park this week! 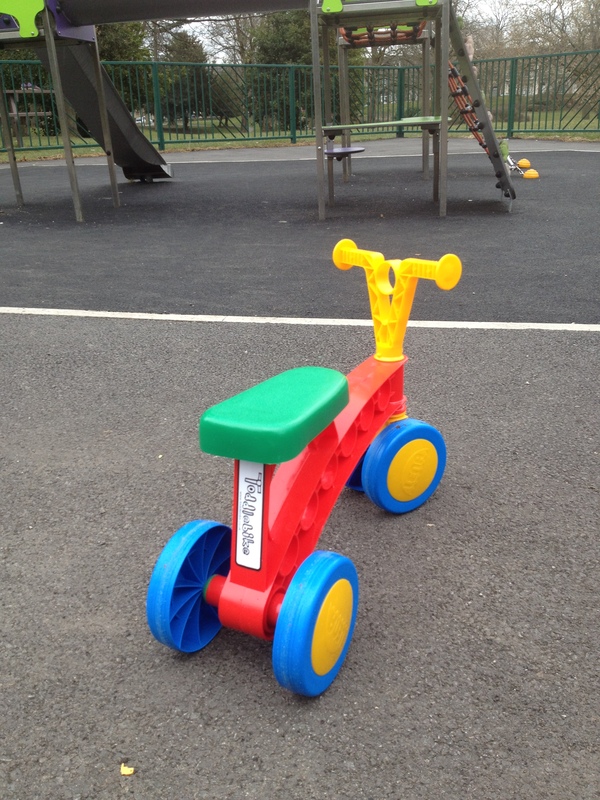 We will be taking the Toddlebike on our holiday next month so watch this space for review number two!